One of 15 children, Thomas Vernon, sometimes confused with his father, Sir Thomas Vernon MP (d1710) and a Director of the East India Company, was a Turkey Merchant who became an MP in 1710. He remained in the House of Commons with one short break until his death in 1726. For a short while he held office as a Lord Commissioner of Trade and Foreign Plantations, in 1713-14. A younger brother, Sir Charles, was also a Turkey Merchant and an MP from 1731 until 1761. Genealogy of the Vernon family is complicated by marriage within the family: Catherine, a sister of Thomas, married George Vernon (1635-1702) of Sudbury, Derbyshire. It was his third marriage: his second was to Dorothy, daughter of Sir Robert Shirley by his first marriage. Later 1st Earl Ferrers, he came to live at Twickenham in 1711. 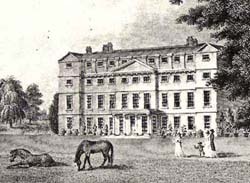 Twickenham Park in 1795 from Angus' "Seats of the nobility"
Thomas is recorded as living in a grand house at the top of Surrey Street, Westminster. In 1702 he bought the Twickenham Park estate from the Earl of Albermarle, a friend and companion of King William III. Over the years he acquired a good deal of land within Twickenham Parish. In particular he bought properties along the river in Cross Deep which he leased to Alexander Pope in 1719. In 1713 he became a churchwarden in company with Sir Godfrey Kneller, charged with the responsibility for the rebuilding of St Mary's collapsed nave. Vernon was suspected of being deeply involved in the collapse of the South Sea Bubble of 1720-21. He was expelled from the Commons in that year but regained his seat in 1722. His brother-in-law, John Aislabie, the Chancellor of the Exchequer, was also heavily involved and resigned in disgrace but kept much of his wealth. Another Twickenham resident was also involved. This was James Craggs the younger, who then lived in a house at the corner of Cross Deep and King Street, called “the Grove”. Craggs was much admired by Alexander Pope. Young James, at this time Secretary of State, died of smallpox before the scandal broke and lies buried in Westminster Abbey. James Craggs, his father, was less fortunate. Bearing the chief blame for the financial disaster when the Bubble burst, he committed suicide. Thomas was married with three daughters: Jane, the eldest died unmarried and was buried on 6 June 1734, Matilda who married Charles Repington (12 January 1746/7 at St Mary Marylebone Road, London) and Annabella who married William A'Court (22 February 1746/7 at the Chapel of St Bride's, Fleet Street, London). Matilda and Annabella inherited the property and lands in Twickenham after the death of their mother, Jane, on 18 January 1741. Annabella died on 6 March 1777 at Heytesbury). Charles Repington died and was buried at Twickenham on 14 December 1764. Many of the Twickenham properties remained in the possession of their descendants (the Repingtons and the A'Courts) into the early 19th century.